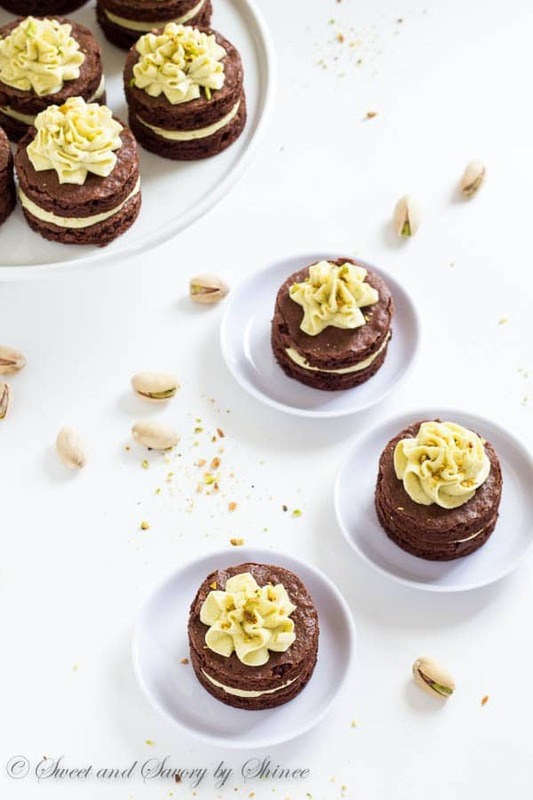 Fudgy, yet light chocolate cake layers, filled with fluffy pistachio buttercream and cut into adorable mini cakes, are irresistible crowd-pleaser. When you’ve got extra pistachio paste on hand, what do you do? 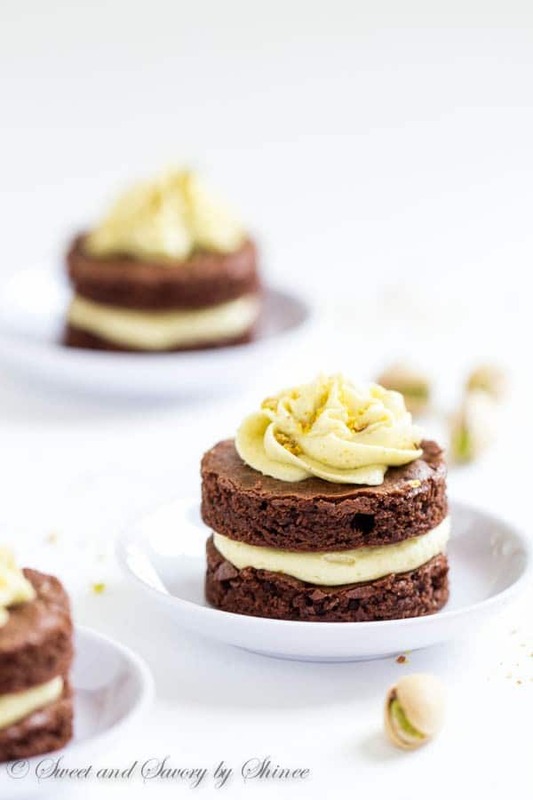 Whip up a pistachio buttercream. Then whip up a chocolate cake. Right? There is just no other way around it. Elegant. Cute. Irresistible. On the outside. Fudgy. Light. Flavorful. On the inside. Yes, these little layer cakes are absolutely the best. Inside and out. Perfect cross between fudgy brownies and fluffy cake, this chocolate cake got the best of both worlds. And paired with creamy, fluffy pistachio buttercream, this mini cakes are unstoppable. To make the chocolate cake, I adapted the recipe for my mini caramel lava cakes and baked into a sheet cake. 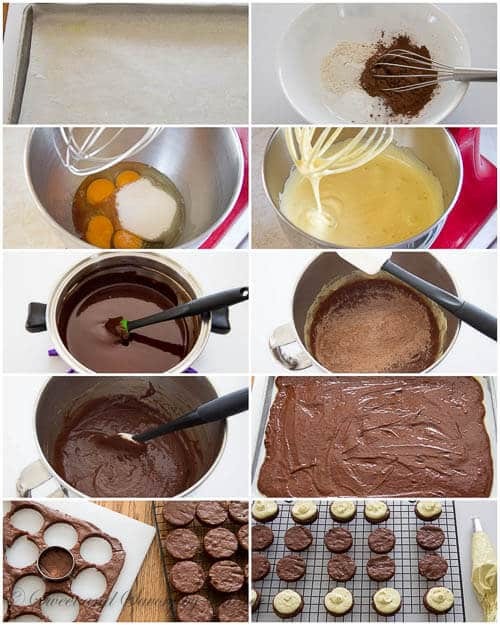 Note, it’s so similar to brownie recipe, but with a BIG difference in the method of preparation, which affects the overall texture of the cake. To create light and fluffy cake texture, we need to beat the eggs and sugar for an extended time until it’s thick, white and tripled in size. With my stand mixer, it takes about 5 minutes. If you’re using a handheld electric mixer, it’ll take up to 10 minutes. Be patient, and you’ll be rewarded. Another thing to watch is the baking time. Be careful not to over-bake the cake. The batter is spread into a thin layer, so it doesn’t take long to cook. Other than that, it’s pretty straight forward. As usual, here is the step-by-step photos for those who love visuals, like me. 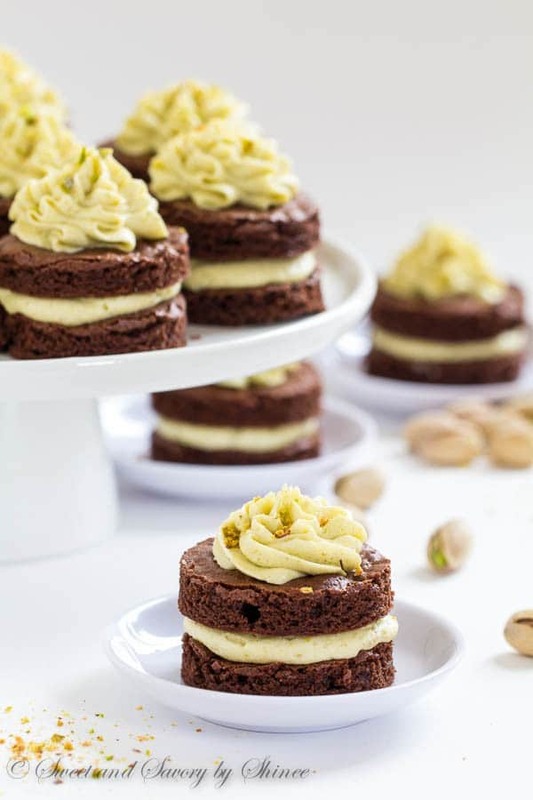 For detailed recipe for pistachio buttercream, check out this post. These beauties are, hands down, one of the best things happened in my kitchen. They were devoured in a flash at the ranch! Meanwhile, in a medium heatproof bowl, combine butter and chocolate and melt in double boiler over simmering water. Remove from heat and cool slightly. Then using a rubber spatula, gently fold in the melted chocolate mixture into the egg mixture. Add the flour mixture and gently mix until just combined. Pour the batter into the prepared baking sheet and tap a few times to get rid of bubbles. Bake for 10-12 minutes, or until inserted toothpick comes out clean. Transfer onto a cooling rack to cool for 5 minutes. Then place a wire rack on top of the cake and invert. Remove the baking sheet and peel off the parchment paper. Now place another wire rack on the cake and then invert it again so that the top of the cake is up. Cool completely. 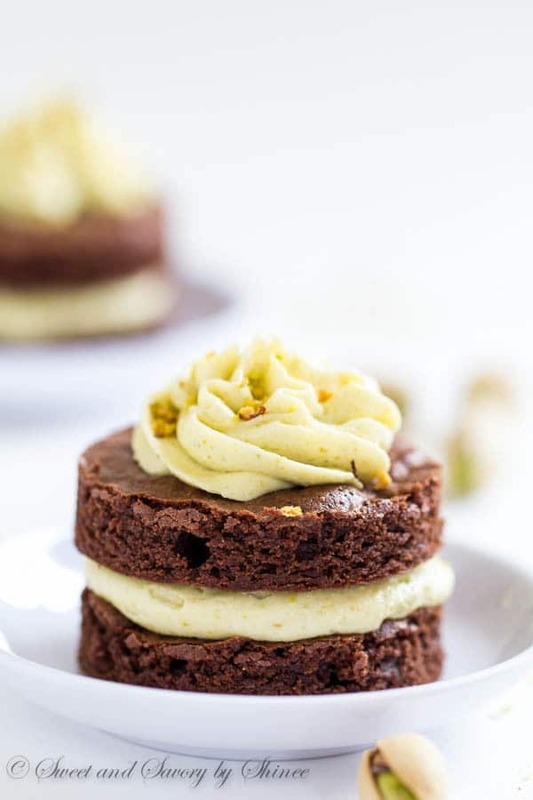 While the cake is cooling, prepare pistachio buttercream frosting. In large mixing bowl with paddle attachment, or using a handheld electric mixer, beat the butter and pistachio paste until fluffy, about 2 minutes. Add the powdered sugar, heavy cream and vanilla extract and beat until smooth and fluffy, about 2 minutes. Transfer the frosting into a piping bag with a round tip (I used Wilton 1A decorating tip). 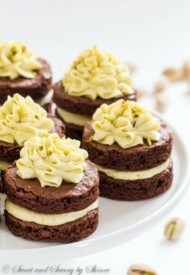 Once the cake is cooled completely, cut out 2-inch circles using a round cookie, or biscuit cutter. You will get about 35 circles. Place the cut out cake circles on wire rack. Pipe about heaping tablespoon of frosting on half of the cake circles. Using an offset spatula lightly spread the frosting and top with remaining plain cake circles. Replace the round tip with star tip (I used Wilton 1M decorating tip) and frost the second layer. Sprinkle some chopped pistachio, if desired. You can mix the leftover cake scrapes and buttercream frosting in the mixing bowl with paddle attachment, or using a handheld electric mixer, and make cake pops. *Pistachio Paste- You can use either store-bought one, or make it yourself. I shared how to make homemade pistachio paste here. It’s super easy!